This is a student self-portrait project on a contemporary artist that Alexandra Muir, 12 years old from Sydney, Australia did on one of Ian’s self-portraits. In ‘Self-Portrait 07′, I see a solemn man wearing a dark red shirt. He has fair skin and dark eyes. He has short, brown hair on his head and has pale lips. He is in front of a blue background, which is dark at the top of the picture and light near the bottom. The material used for ‘Self-Portrait 07′ is Acrylic on canvas. The composition has been organised very simply, with the artwork starting at Ian Darragh’s shoulders and ending a bit above the top of his head. He is looking to the right a little, although his head is directly facing you. 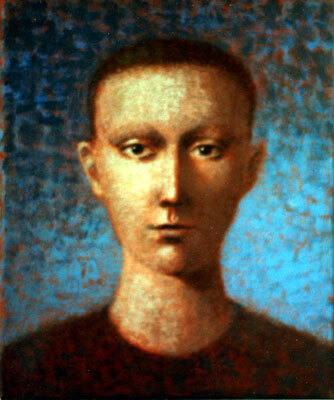 This self- portrait painted by Ian Darragh was created in 1986 in London; he had a studio at the Diorama Arts Centre. In that year, 1986, IBM unveiled the first laptop computer and Challenger Space Shuttle exploded and killed seven astronauts. Ian Darragh was from Ireland and was male. His religion is unknown to me. I really like ‘Self Portrait 07′, by Ian Darragh and I think it shows a lot of Darragh’s painting style. I think it shows a lot of expression and it is very simple. I like the clear outline of his head and shoulders and I like how the background is light at the bottom and gets darker. It makes me feel sad because of the powerful expression on his face. I think when painting ‘Self Portrait 07′ in 1986, Darragh probably felt happy, as there was a cover and feature article about his work in ‘Art Line International Art News’ magazine, and he had lots of exhibitions in Europe and England in that year. This entry was posted on Saturday, May 30th, 2009 at 6:23 pm	and is filed under News. You can follow any responses to this entry through the RSS 2.0 feed. Both comments and pings are currently closed.